I know I will never be forgiven for this, but Stranger Things just doesn’t do it for me. I get it, of course, and respect the hell out of its production, but sometimes its relatively tame nature, for me, leaves something to be desired. I love a coming of age series, especially when it is tinged with a terror that has real grit. It’s why Are You Afraid of the Dark was my favorite show as a kid, far superior to its more cartoonish competitor, the TV version of Goosebumps. American Horror Story is closer to what I want; it certainly has some grit and some pretty wonderful camp, and I watch every season with glee (no pun intended for Ryan Murphy fans) but it just doesn’t hold itself together, sort of sprawls its storylines out like marbles across a floor, and I just can’t get my footing. AHS is brilliant in moments, but (aside from season two, which I think was the best) it often leaves me unsatisfied and confused. I absolutely love Black Mirror, and believe it will go down in history the way The Twilight Zone has, but I also crave a longer-form horror show, with character development that extends beyond a single episode. We were blown away; how could we have missed this? It looked like a coming-of-age story far more terrifying than anything Stranger Things would ever come up with. We watched the first episode immediately, and then another, and felt like we had died and gone to our own personal horror heaven. We were hooked, immediately. The imagery was intense and morbidly beautiful. the writing strange and refreshingly different. And to top it off, the main plot revolved around an 80s TV puppet show with unnerving marionettes, perfectly crafted from my personal nightmares. The plot was oddly familiar, so I googled the show and found out it was based on a creepypasta I had read and loved a few years ago. If you aren’t familiar with creepypasta, it is a form of storytelling that happens online, and was popular in the mid-2000s when people began to write their own horror shorts and share them via message boards like 4Chan. They were almost like internet urban legends, and there was an unspoken rule that if you interacted with the post, you treated the story like it was real. From there, people would expand the legends, sometimes with fake evidence to try to prove the story was real. Ever heard of Slenderman? That is probably the most famous example of creepypasta, and we saw the real-life stabbing of 12-year-old Payton Leaner (she survived) by two of her friends that believed the legends were true, and that they needed to sacrifice their friend to the inhumanly tall, faceless man the internet told them was real. There is something deeply, deeply disturbing about some of the creepypasta I have read, even outside of the story of the Slenderman stabbing. I really don’t know how to explain the way they make me feel. Deeply uneasy, the way you might feel experiencing the Uncanny Valley, an eeriness that just sits inside your body, one that makes you think about your world in a different way. It’s not necessarily a bad feeling, but it’s strange. Antosca was a big fan of creepypasta, and I imagine he would know what I was trying to explain. He says that the show started as a way to tell the story of his particular favorite, which also happens to be mine, the aforementioned Candle Cove. Check out the story here. It is told through the format of several people responding to a post on a message board about a kids TV show they barely remember, but one with terrifying elements, one that was definitely not appropriate for children, one that may have only existed in their collective minds. Candle Cove, though the weakest in overall plot and critical reception, haunted me in such a particular way, one that has lasted since. The amazingly 80s-authentic, confusingly terrifying puppet show, and the idea that there are so many things that happened to us in childhood that we do not remember, or we remember incorrectly, moments that we can feel the echo of inside of us, the feeling, but not the actual visual memory, was enough to freak me out on a deeper, subconscious level. It brought back fuzzy memories of the Neighborhood of Make Believe from Mr. Rogers' Neighborhood. There was certainly nothing nefarious about that puppet show, but really, those puppets were creepy. After the first episode of Candle Cove, I had a hard time falling asleep, and for a hardened horror addict like myself, that is a real feat. Season two was better received by critics and audiences, boasting a 98% on Rotten Tomatoes, and told a tighter story. Based heavily on another favorite creepypasta called NoEnd House, this season told the story of a haunted house that randomly appeared in different parts of the world, one that was somehow perfectly tailored to each person’s specific fears, and did not seem to live within its own walls. It’s hard to tell if you’ve actually left the house—or if your new reality is just another one of its many impossible rooms. Yeah, it’s a psychological nightmare. It also kept me from sleeping, gave me weird dreams (why does that make me happy???). Season three just ended this month, and has received rave reviews, and a 100% critical reception on Rotten Tomatoes. Antosca chooses a different indie director for each season, and credits season three’s success with his newest: “Arkasha Stevenson truly elevated this season. She's amazing and she brought ideas and instincts that no other director could have." This season was full of particularly beautiful cinematography that added to its dream-like quality. Channel Zero: Butcher’s Block tells the story of two sisters struggling against inherited mental illness who move to a new town, one haunted by a poverty and dysfunction that seems to come from a supernatural source. People from the poor part of town go missing regularly, and together with their eccentric landlord and a local cop, the sisters try to figure out the bizarre mystery. It all seems to point to the Peaches, a rich family from the past that once owned the local meat factory, and thus, virtually owned the town. The season tackles the struggle of mental illness in a new and illuminating way, while not shying away from the darker aspects, and also tackles issues of class and wealth distribution. And that’s the other thing about Channel Zero: it tackles difficult themes, but in such as way as never to compromise its artistic integrity. It has emotional grit; it terrifies on a level that can, for me, only really be compared to David Lynch. It doesn’t force itself to say anything. It shows you, and lets you decide what meaning you place on the plot, the characters, the imagery. But one thing is for sure, it's not simply horror for the sake of horror. Channel Zero gets at something deeper, scratches at your subconscious fears and releases your old bad dreams. But somehow, that’s a good thing. The great thing about anthology TV is that you can choose whatever season peaks your interest, without having to start at the beginning of the series. 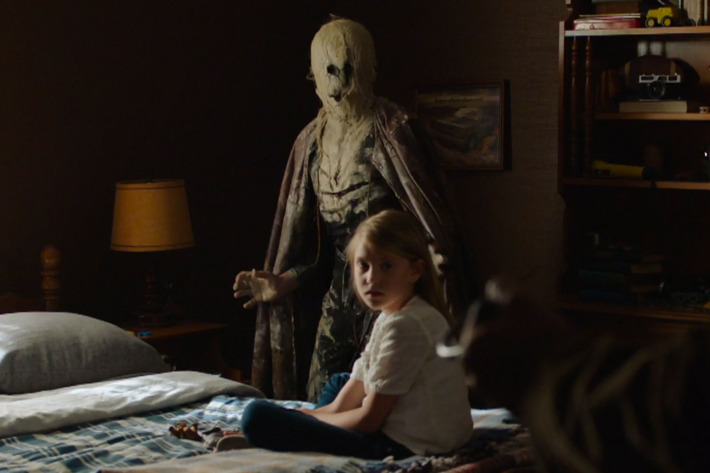 Each season of Channel Zero is always comprised of six episodes, which keeps the story on track, leaving no extra room for non-vital plot lines and scenes. There is less of a time commitment with this show, but honestly, no less pay off. Antosca and his team of writers create a lean story, one that never meanders and is still chocked full of disturbing, lasting imagery; a terrifying beauty that I long for in TV and movies, and that only a select few talented teams seem able to accomplish. We’ll have to wait until 2019 for season four (devastating), but here’s what we know. “Season Four is a love story. It's about a marriage -- or any serious romantic relationship -- and what we bring to that,” Antosca told PopMatters. Rumors are spreading that season four is based on the creepypasta I Found a Hidden Door in my Cellar. At least I can rewatch all three seasons until then. You can stream all three seasons of Channel Zero on Syfy’s website, here.